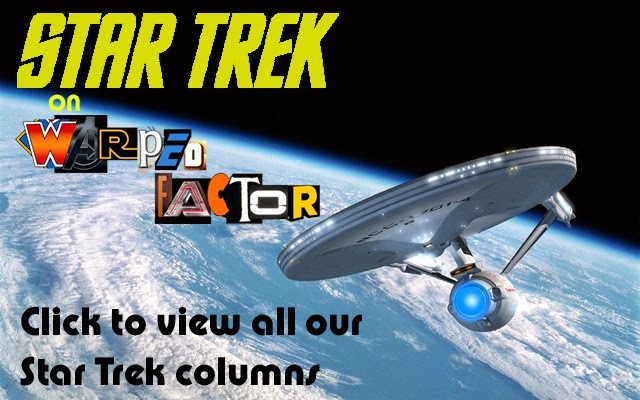 Revisiting STAR TREK II: THE WRATH OF KHAN | Warped Factor - Words in the Key of Geek. Greg Bakun takes an in-depth look back at Star Trek II: The Wrath of Khan. 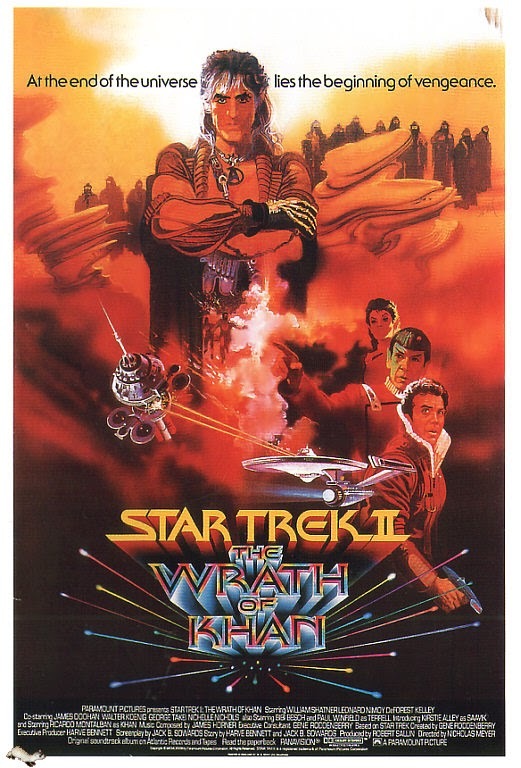 Star Trek II: The Wrath of Khan is an extremely enjoyable film. If I were to do a proper film review, that sentence would sum it up nicely. It is such an enjoyable experience with some great dialogue, wonderful effects work and an amazing soundtrack. I just don’t think the cast have ever been any better in their roles and they are never as good again. In Star Trek: The Motion Picture, the whole thing has an atmosphere of getting to know you again. It’s very introductory and kind of nervous. The story takes a back seat to the whole newness of the Star Trek universe. It doesn’t have a lot of urgency to it. I actually really like the film but it is kind of like taking a trip through outer space in real time with people you haven’t seen in a long time. The colours in the Enterprise are often oversaturated with the exception of the bridge. Although the new look Enterprise model is amazing. It’s not surprising at all that a lot of the current reboot takes a lot from its design. The film cost $46 million dollars to make and it was way too expensive for Paramount. If there was to be a sequel, there would need to be changes. First change was the removal of Gene Roddenberry as producer and Paramount made him an executive consultant. Next was to bring in a new producer named Harve Bennett. Bennett worked on such programs as The Mod Squad, The Six Million Dollar Man, The Bionic Woman and Salvage 1. He was appointed to executive produce the next Star Trek film at Paramount by Michael Eisner and Barry Diller after he told them he could produce the film for a lot less than the first one. He succeeded with doing this by keeping the film to $11 million. Bennett was unfamiliar with Star Trek and when he knew he was going to produce the second film, he went through all 79 episodes of the original series. He felt that the first film lacked a real physical villain and as he went through the episodes, one stood out. Khan Noonien Singh, or known simply as Khan, was a character in the original series episode, Space Seed. When getting ready to view the film, I went back to the original series episode first. I don’t think I ever really watched it all the way through before. It’s really interesting as the episode ends, it almost as if it is setting itself up for some kind of sequel. Of course, I am watching all of this in hindsight but I wonder if it had ever crossed the writer’s or Roddenberry’s mind to go back to this character in the original series sometime later? It is a perfect set up. Bennett brought in Nicholas Meyer to direct the film. Meyer also completed the final drafts of the scripts uncredited. He also had never seen the series and went back to watch as much of it as he could. The film is quite somber throughout. It deals with such themes as growing old, friendship and death. The film begins as The Enterprise is getting a new inexperienced crew under Captain Spock. The old crew will either be moving on or perhaps retiring. During a training exercise called the Kobayashi Maru, it appears the Enterprise is under the command of a female Vulcan named Saavik. As this is an exercise, she does very poorly which bothers her. She finds out that the only person to successfully make it through the exercise is Admiral James T. Kirk. Meanwhile, Chekov is now the first officer on the U.S.S. Reliant. They are working with a group of scientists on a project called Genesis. The Reliant is trying to find an uninhabited planet to test this experiment. They go to what they believe is Ceti Alpha VI and need to check out the surface since they are receiving readings of life signs. Only when Chekov and Captain Terrell are beamed to the planet, Chekov realizes a huge mistake. They find the remains of a spaceship that appears abandoned but is called The Botany Bay. They are not on Ceti Alpha VI; they are on Ceti Alpha V. Before Chekov can get Terrell and himself back to the Reliant, they are stopped by a band of warriors led by an aged Khan. The plot kicks into gear as Khan is able to control Chekov and Terrell through mind control eels. Khan is able to capture the Reliant but he is not happy with just escaping; he now sets his sights on revenge on Kirk. The Reliant goes to the Regula I space station where all work on the Genesis project is based. Khan wants this and knows that somehow he can get Kirk through its capture. Kirk receives an urgent distress message from Dr. Carol Marcus in regards to the Reliant coming to get Genesis from them. Starfleet orders the inexperienced trainee crew of the Enterprise to Regula I as Admiral Kirk takes back command of the ship. Nearby Regula I, the Reliant intercepts the Enterprise and draws her into battle. This is the first time we actually see any of these ships damaged from fighting each other which is kind of shocking. Looking back at the original series, the most we would see is the crew throwing themselves around on the set. Here, we see the physical tearing apart of the ship. We see the bridge and other areas blown apart and people being seriously injured. It is real and it is gruesome. For people who have only seen the original series or the first film, it is shocking. The Enterprise is seriously battered and disabled. Of course, the Enterprise eventually fights back and gets away from the Reliant to make its way to Regula I. No one is left there except Chekov and Terrell. Everyone realizes that the surviving crew members beamed down to an asteroid along with Genesis. Genesis is a devise that can rebuild life. It has three stages. Stage two was completed and stage three was going to be the planet Reliant was looking for as its test subject. On the asteroid, Kirk and the crew find Carol Marcus and her son David. Carol is more than an old friend of Kirk and David is actually Kirk’s son. Khan knows what is going on because he still controls Chekov and Terrell and has been listening to everything. Terrell and Chekov are ordered to kill everyone but they work real hard to resist those orders. 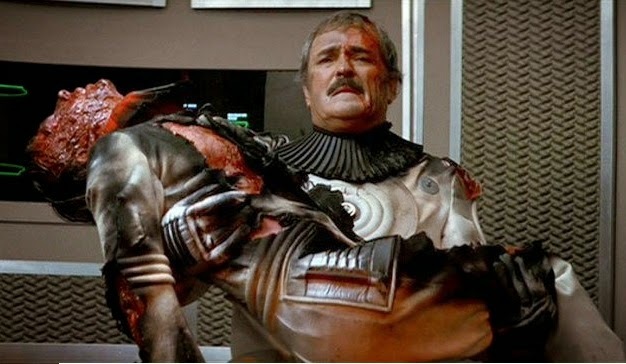 Terrell kills himself and Chekov collapses from the pain endured through the Ceti eel in his ear. Khan appears to win as he beams the Genesis device to his ship. This leads to the final stand off between the two ships. Kirk knows he can not let Khan escape and baits him into following the Enterprise into the Mutura Nebula. In an area of space where communication and visibility are diminished, the two ships play a game of cat and mouse trying to get to other first. Both ships again take a beating but the Enterprise has the upper hand or at least it appears this way. Most of Khan’s crew is dead and the Reliant is heavily damaged. Khan himself is disfigured and dying. He has one last chance which is to detonate Genesis. The Enterprise can’t escape because the warp drive is damaged. To fix it, someone needs to restore it in a chamber flooded with radiation. Anyone who goes in there will be instantly killed. Spock, who knows the danger, goes into the room and restores the warp engines. The Enterprise escapes just as the device is detonated. Their escape is bittersweet with the sacrifice of Spock’s life. This is a really good and often very moving film. 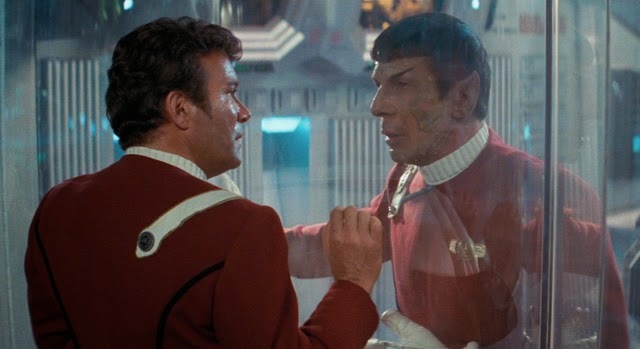 The relationship between Kirk, Spock, and McCoy is so much more natural than it was in The Motion Picture. The theme of growing old is everywhere. Kirk laments growing older and is angry that he is no longer a ship’s captain. For Kirk, it feels like in this film that his life is catching up with him. He knew he had a son but never interfered in David’s life. As he demonstrated with defeating the Kobayashi Maru, he doesn’t like to lose and will go to great lengths to win. With the Kobayashi Maru, he re-programmed the computer so he would win. Now, he is faced with certain death that he is unable to do anything about. The one who saves everyone is Spock and he does it with his life. Even though Kirk wins, for the first time he also loses. As much as I love this film, there are a couple of things which are kind of head scratching WTF moments. The obvious ones to Star Trek fans are when Khan sees Chekov and says, “Now you, I remember. I never forget a face.” Khan, does this include faces you’ve never seen before? 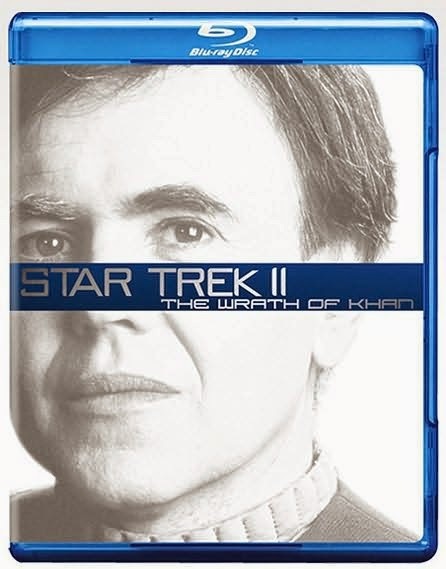 Chekov was never in Space Seed as Walter Koenig was not a member of the cast yet. That’s an easy one to explain as it could be written off as anything and there has been some retconnecting to explain how Chekov could have met Khan during unseen moments of the episode. Another is Stage 2 of the Genesis experiment which is done underground in an asteroid and supports life forms such as birds, plants, food. We see this beautiful vast cavern which is the result of Genesis. Further back there is a light source, like a sun beaming light into the cavern. How is that possible? Did it create a small sun in the cavern too? Just as implausible as Genesis creating a new planet in the Mutura Nebula and seemingly also creates a sun which wasn’t there before shining behind the new planet? My favourite though is after the first great battle between the Reliant and the Enterprise. The bridge is busted up badly but as Kirk turns to the lift he sees Scotty holding what appears to be the lifeless body of one of his cadets. We don’t see this in the theatrical cut of the film but Scotty and this lad are related. Scotty is understandably upset. We then see them all in the sick bay and the boy was still alive for a moment to utter some words to Kirk and then dies. So, why is this interesting to me? Well, Scotty had to take this guy up to the bridge, from engineering probably BYPASSING the sick bay. Plus, although I don’t know the lay out of the ship, I don’t think it is a straight shot from engineering to the bridge. Maybe the boy’s life could have been saved if Scotty wasn’t carrying his body all over the Enterprise and just brought him to sick bay! I love the soundtrack to this film. James Horner did the scoring and has some incredible themes in it. It’s beautiful and easily my favourite music from all the Star Trek films. It’s so good that it is used again on Star Trek III: The Search for Spock. Using the same musical theme, it can easily be used as a march, as inspirational or even as conveying sadness and despair. It can evoke all kinds of emotions. I was gutted when it wasn’t used in Star Trek IV: The Voyage Home. Star Trek music in films has been very inconsistent since the third film. I also felt the franchise was lacking a good solid theme which could bind all the films together. They never seemed to want to really put Alexander Courage’s original theme to good use. I thought Horner’s theme would have been that main theme to the films, but it was not to be. I viewed this from the Blu Ray set which was released to coincide with the Star Trek reboot. It is fun to see some detail which I have never seen before. It’s interesting to notice film grain and how it can change shot to shot. The effects, which were done by Industrial Light & Magic, still hold up very well. I love the Enterprise design and the Reliant was just as good. The details of the ships are astounding with multiple layers and textures on the models. Multiple lights beam out from the model onto other areas of the models to accentuate different sections. The effects used for the Mutura Nebula gives off a feeling of beauty and menace as the ships try to out-maneuver each other. This is probably my favorite Star Trek film. In fact, after watching it I had wondered what would have happened if they never made another Star Trek film after this one. It ends on a bittersweet note. It’s sad that Spock dies but he did so as a hero. The film also finishes with some inspiration. As Kirk, Bones, David, and Carol look out on Genesis building itself; we don’t know what the future holds for them. Judging by their expressions, they don’t know either but they have a future. It would have been nice if it was left at that. I like the all the Star Trek films but this is the final one that really feels like an ensemble cast. In the next one, even though Spock was dead, Kirk learns he is actually alive and needs to bring him to Vulcan. The Star Trek regulars other than the big 3 are from this point on given character moments or “funny” situations which are now almost mandatory in every film. The one that comes to mind immediately is Uhura’s feather dance in Star Trek V. blah. Star Trek II, was an end of an era and so is on a higher pedestal than all the other films in the franchise.